What happens in case of a Flood? 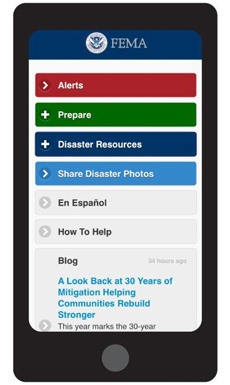 Hope that you’ll receive Federal disaster relief if a flood hits. Many people wrongly believe that the U.S. government will take care of all their financial needs if they suffer damage due to flooding. The truth is that Federal disaster assistance is only available if the President formally declares a disaster. Even if you do get disaster assistance, it’s often a loan you have to repay, with interest, in addition to your mortgage loan that you still owe on the damaged property. Most importantly, you must consider the fact that if your home is flooded and disaster assistance isn’t offered, you’ll have to shoulder the massive damage costs alone. The bottom line is that if you’re looking for secure protection from financial loss due to flood damage, Federal disaster assistance is not the answer. 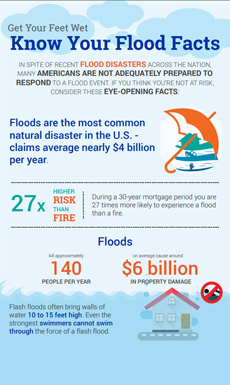 Buy flood insurance and stay protected no matter what. When disaster strikes, flood insurance policyholder claims are paid even if a disaster is not Federally declared. Flood insurance means you’ll be reimbursed for all your covered losses. And unlike Federal aid, it never has to be repaid.In general, a policy does not take effect until 30 days after you purchase flood insurance. So, if the weather forecast announces a flood alert for your area and you go to purchase coverage, it’s already too late. You will not be insured if you buy a policy a few days before a flood.